The game was created during the Schmiede Hallein Game Jam 2016 . 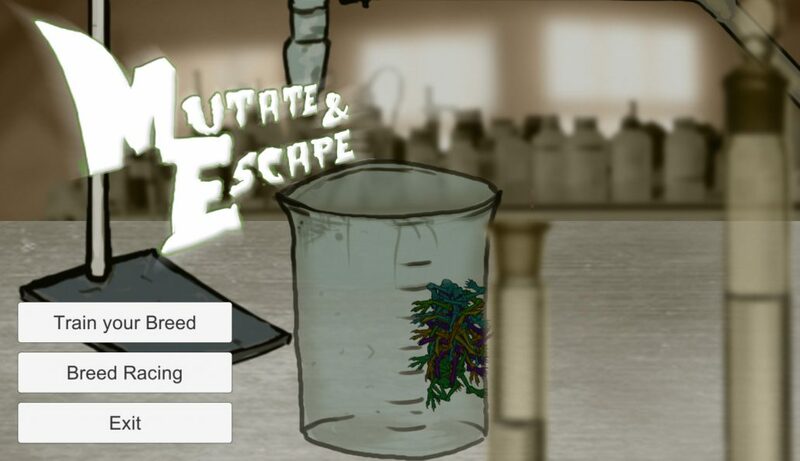 Mutate and Escape is a lemming-like strategy game about bacteria escaping a laboratory. 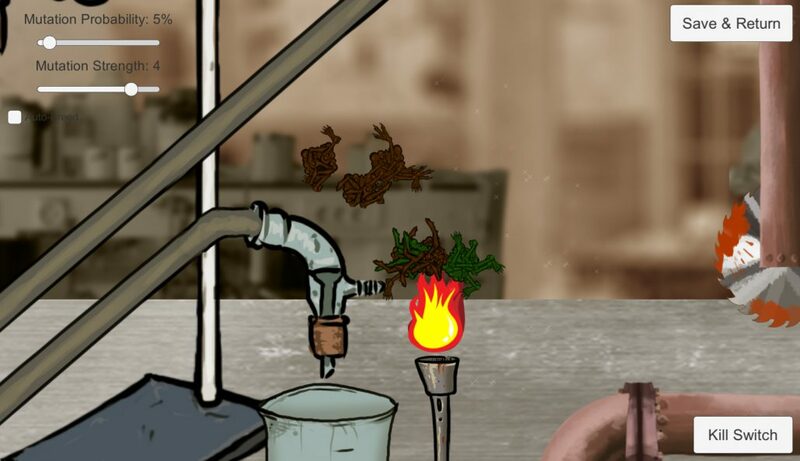 It’s the year 1963, in a secret shady laboratory in the vicinity of Hallein, there the inexplicable: has happend, the bacteria in the lab have evolved and they are trying to escape! You are in the role of the creator and in control of evolution and mutation of the bacteria. Choose wisely which bacteria build the base for the next generation and how much they should mutate to bring them to their ultimate goal: Freedom! You start with a handful of bacteria that just started their journey to freedom, but do not know of any dangers outside the petri dish yet. Follow their attempts to reach the window of the lab and pick the strongest and most advanced of them. When you decide, or when all bacteria of a generation have fallen in the laboratories hazards you pick two or more bacteria to cross breed them and set the probability of mutations and also the strength of the mutations the next generation of bacteria should have. 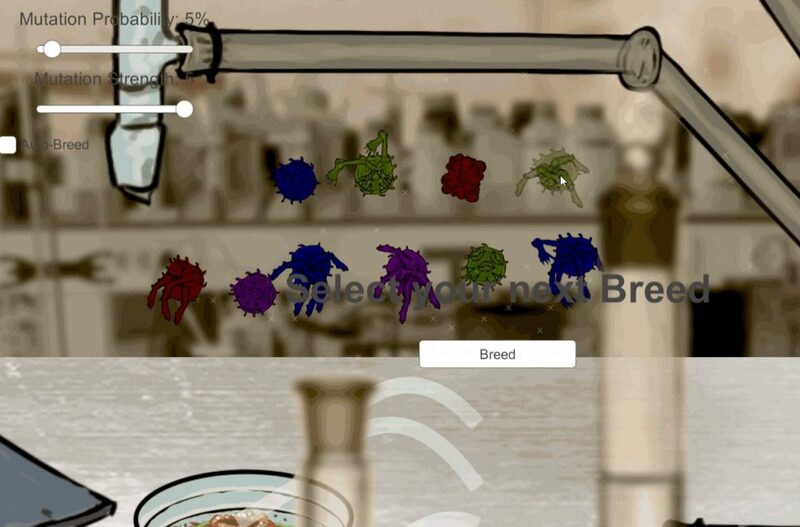 Hit the „Go“ button and the bacteria will start their next attempt at escaping! The game is based on neural networks. Every bacteria has ist own neural network and detects walls and traps with built in sensors. By cross breeding bacteria their neural networks will be combined and the next generation inherits the combination of their abilities (50:50 chance). By playing with the mutation probability the amount of mutated bacteria in the next generation will be set and with the mutation strength the severity of the mutation of abilities willl be defined. By choosing cleverly and acting like the neural networks fitness function one is able to create a neural network that guides the bacteria to freedom without harm. 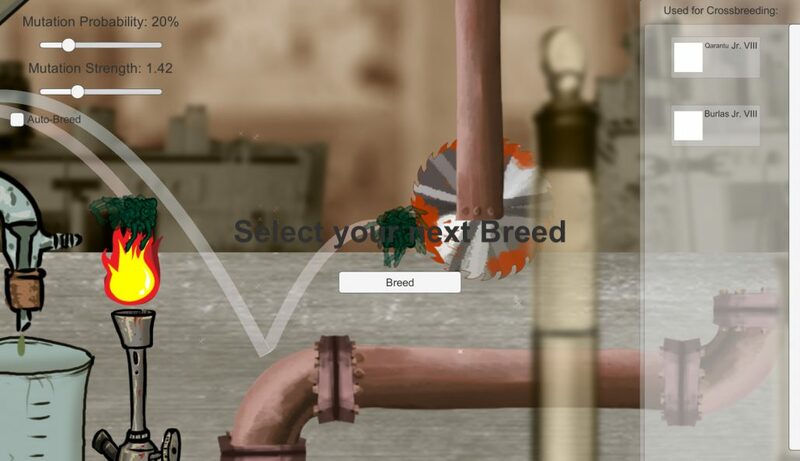 There is also an auto-breeding function, which allows an automatic breeding with the built in fitness function. This is far slower and may not get the results one wishes to achieve, or the result will take a very long time. Next step will be the implementation of sound and more levels. After the singleplayer is done we will add the multiplayer component and implement it. Follow my progress on Twitter to keep informed about future updates!